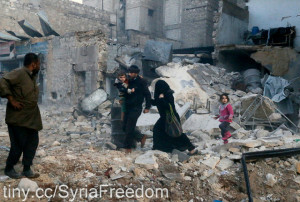 Syria (MNN) — It sounds like the setting of a post-apocalyptic novel. Citizens are left in the shelled-out husk of a war-torn city. Those who were able to leave have fled. Electricity is turned on only intermittently by the government — otherwise it is dark, and the cold of winter has set in. Water and food is scarce, and what little that’s brought in is quickly picked over by the masses or priced so high it’s difficult to afford. Without jobs, without order, gangs roam the streets at night, and you can’t really trust the person next to you. Government officials go door-to-door in search of remaining rebel militants. This isn’t a piece of fiction. This is real life right now for the people living in Aleppo, Syria. Steve Van Valkenburg with Christian Aid Mission shares, “Basically, the attitude of the people is that they’re scared, they’re not sure what’s going to happen. The government is not sure who to trust. The government doesn’t know if there are militia members just mixed in with those who are fleeing, and people who stayed behind may be actually militant members and may be pretending to be regular citizens. So there’s a lot of door-to-door and searching by the government and a lot of just not being sure if the person next to you may be a suicide bomber. Van Valkenburg says Christian Aid Mission has multiple ministry partners currently in Aleppo, and they’ve been able to describe the reality of the situation. But what’s so surreal is, in the midst of Aleppo’s rubble and carnage, the Holy Spirit is stirring. “One encouraging thing was that an agency within the government has asked a ministry if they would have kids programs all this week. So every other day, they’re having kids programs, and they’re evangelistic programs. They’ve been very effective in the past, and actually have seen thousands of people coming to their meetings,” says Van Valkenburg. Christian Aid ministry partners have also erected prayer tents throughout Aleppo and hosted prayer times — both near and within the areas where rebels vacated. And Muslims are coming to them for prayer. One of the biggest needs right now in Aleppo is heating and supplies to survive the rest of the winter. Christian Aid is helping their ministry partner supply blankets, hot water bottles, Bibles, and supplies for the children’s outreach. They’re also working on food baskets and bringing in t-shirts, socks, and gloves for kids. So what can you do with this information? Well, first and foremost, you can intercede for Aleppo before the Lord. Then, if you feel moved to give, click here to go to Christian Aid’s website or call them at 434-977-5650. “We are regularly sending help to the Christians in Aleppo to enable them to reach out with the Gospel and to show the love of Christ to the people there in that hurting area,” says Van Valkenburg. May God bless you ! I would like to have your news ! May the Lord bless those hands that are carrying material need as well as Bibles and tracts. They are the light that shines in Darkness. We will keep them, and for the salvation of many whom they are ministrying to, in our prayers. Pray for those in Aleppo to be comforted by the Holy Spirit as their Comforter. 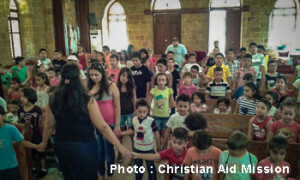 Ask God to bless the ministry of Christians within Aleppo. Thank Him for the ways the Holy Spirit is stirring within the city already. 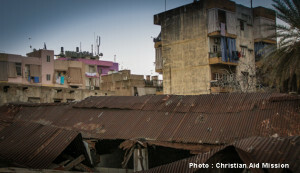 Give to Christian Aid Mission and support this desperately needed ministry.